From its famous beaches to its jaw-dropping landscapes, Rio de Janeiro is one of the hottest honeymoon spots on the planet. Honeymooners after a holiday of fun in the sun will fall in love with Rio de Janeiro. Rio’s beaches are visions picturesque white sand perfection, and Rio’s evolved beach culture celebrates care-free enjoyment. While Rio lends itself to mid-market to luxury when considering flight, hotel, and other incidental costs, it can be done on a budget if you avoid the enormously popular New Year’s and Carnaval. Rio offers something for everyone with a vibrant arts scene, shopping, dining, beach activities, and outdoor excursions. The National Museum, Botantical Gardens, and the neighborhood of Santa Teresa will allow you to indulge your senses with art, performance, and innovative dining. On the beach, you can work on your tan, play volleyball or soccer with other beachgoers, or go out surfing. The most tempting attractions are to visit for New Year’s Eve and Carnaval. These two holidays showcase Brazil’s vivacious and fun-loving culture, and offer a chance to party with and like locals. If visiting for these times, be sure to look into booking airfare, hotels, and tickets as soon as possible to find availability and pricing suitable to your budget. Once you’re there, be ready to dance and have fun! Start planning your Rio de Janeiro honeymoon with this helpful guide. Rio de Janeiro enjoys a consistently tropical climate where the average daytime temperature will vary between 70 and 80 degrees Fahrenheit. Peak season is during the southern hemisphere summer (December through March), which includes New Year’s Eve and Carnival celebrations. Expect sky-high rates on hotels and airfare for Carnival, in particular. 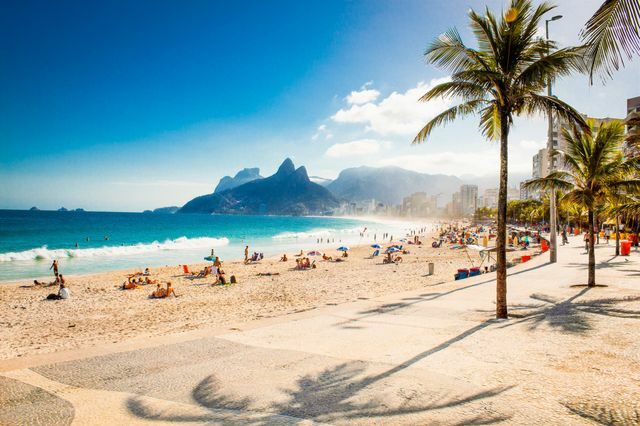 Beaches: It would be practically sacrilege to miss out on Rio’s beaches on your honeymoon. The main beaches are Copacabana, Ipanema, and Leblon. Corcovado: With Copacabana beach, the mountain of Corcovado and its statue of Christ the Redeemer are Rio’s most famous symbols. The view the mountain commands is unparalleled. Pão de Açúcar: “Sugarloaf Mountain” offers another stunning view of Rio, and the remnant rainforest is a haven for toucans, monkeys, and butterflies. Maracana Stadium: The largest soccer stadium in South America and home to the local Soccer Museum is a must-see if you’re a fan of the sport. Jardim Botânico: The astounding plants and peaceful trails of Rio’s botanical garden can provide a much needed respite on your honeymoon. Museu Histórico Nacional: The National History Museum houses a significant art collection documenting Brazil’s colonial and imperial history. Carnaval: This multi-day party is Rio’s largest event, in a celebration of music, dance, and Samba. New Year's Eve: Rio’s New Year’s celebration is the largest in the country and attracts 2 million to Copacabana beach for fireworks. Hang Gliding and Paragliding: If you’re up for some thrills on your honeymoon, Rio is an excellent hang/paragliding location due to its mountains and winds. You can soar above the city and land on the beach! Favela Tours: These tours take visitors into the shantytowns of Rio to meet local people and see the “real” Rio away from the downtown/beachside tourist bubbles. Santa Teresa: This hillside neighborhood is the hub of Rio’s artistic scene, home to fashionable galleries, museums, and restaurants. Theatro Municipal do Rio de Janeiro: The Municipal Theater is an architectural gem and worthy of a tour, and if you’re in luck, there may be a performance on.